The evolution of organisms with complex internal skeletons is supposed to have occurred around 500 million years ago. The absence of fossil evidence for intermediary stages between major transitions in organic design, indeed our inability, even in our imagination, to construct functional intermediates in many cases, has been a persistent and nagging problem for gradualistic accounts of evolution. The evolution of organisms with complex internal skeletons is supposed to have occurred around 500 million years ago. Despite the lack of fossil evidence for this supposed transformation, evolutionary beliefs make the acceptance of this prehistoric phase necessary. In spite of the fact that no one knows what the first vertebrate looked like, it is considered the ancestor of all fish, amphibians, reptiles, and mammals that have ever lived. This ancestor would sit at a major branch of the evolutionary tree of life. If this ancestor is not real, the branch that has led to much of the life on earth falls off the tree. According to evolutionists, after the first fishes had evolved, they dominated the seas and gradually grew legs—another transition that is missing from the fossils. Complex lung structures had to develop, and new reproductive methods had to be in place for the arrival of reptiles. Some unknown ancient reptile gave rise to what we know today as reptiles, birds, and mammals. The countless number of changes in genetic information that would be necessary to make even the smallest of these changes is impossible based on what we know about genetics today. Despite terms like “evolutionary milestone” and “key adaptations” used in the textbook stories of evolutionary history, there is no evidence that these changes actually happened. As we look at the fossil record, fish have always been fish, and mammals have always been mammals. There is certainly a great amount of diversity within all vertebrate groups, but this diversity was preprogrammed into the created kinds by God. * Contradictory claims were presented in the textbooks reviewed. The story of the origin of vertebrates picks up where the evolution of invertebrates left off. The fact that vertebrates and echinoderm invertebrates both follow a deuterostome pattern of embryo development links the two in the evolutionary framework. From some common echinoderm-like ancestor, all vertebrates are supposed to have risen through the ranks of evolution. It should be pointed out that evolution is not considered an upward process that ultimately leads to some goal. The bacteria of today could actually be considered more evolved than humans, as they have been evolving for a longer time. Evolution can be described as the information-gaining process that has led bacteria to evolve into birds. Evolution is also described in terms of losing new functions after they originally develop. These apparently contrary forms of evolution, gaining and losing information, highlight the plastic nature of the theory as it bends to accommodate any new evidence. The apparent loss and gain of functions make the evolutionary story contain a multitude of “naturalistic miracles”— if such things can exist. The evolution of dinosaurs into birds is no different from the evolution of flightless ostriches from some flying ancestor. Evolution can be interpreted in any way necessary as long as the underlying assumption that evolution has occurred is not challenged. Vertebrates represent the highest level of complexity of organization in the molecules-to-man evolutionary model. Although pictures similar to this one used to be common in textbooks, they have been replaced by pictures and illustrations showing much smaller degrees of change. In a simplified version of vertebrate evolution, hagfish and lampreys evolved from some invertebrate chordate, the bony fish and cartilaginous fish evolved from some unknown ancestor of the lamprey group, amphibians evolved from an ancestor of the bony fish, reptiles evolved from amphibians, and birds and mammals evolved from reptiles. The details of how each of these steps occurred is an example of historical science. Major assumptions and inferences fill in the gaps of the story. These gaps are commonly referred to as “milestones” or “key adaptations” and are mentioned in the textbooks without any supporting evidence. In the evolutionist’s belief system, these milestones must have happened because we can see the results today. One of the most glaring problems with the evolutionary story of vertebrates is the lack of transitional forms. As in other fossil groups, major phyla appear abruptly and fully formed in the fossil record. The origin of amphibians from bony fish was thought to be demonstrated in the lobe-finned coelacanth fish. Observations of the fish in their deep-ocean habitat has shown that they don’t use their fins to walk on the bottom—a trait that allegedly led to their becoming amphibians. Lungfish were also thought to be ancestors, but lung development has made this an unlikely ancestral group. The recent Tiktaalik fossils have provided another option, but the lack of appendicular skeletal support structures (shoulders) and the absence of the hind limbs leaves this an unlikely scenario. There is no clear agreement on whether the lobe-finned fish are the ancestors to amphibians. The color coding of the bones in this and other pictures is just as much evidence for a common designer as it is for a common ancestor. After fish had become amphibians, life was primed to invade the land without relying on the water for reproduction. As reptiles evolved, they needed to adapt to a dry environment to exploit an open niche. Scales were needed to prevent the skin from drying out in the open air and provide protection from harmful UV rays. An efficient lung system had to evolve to allow reptiles to move onto land. The evolution of such soft-tissue structures is one area where inferred stories, based on assumptions, are the only source of information. The absence of preserved soft tissue makes interpreting these structures difficult. Reproduction on land requires the development of some mechanism of internal fertilization. Not only did the eggs need to be fertilized internally, they needed to evolve a structure that would protect them from drying out once they were deposited. The development of this amniotic egg requires the genetic information for many new structures. As has been discussed, natural selection cannot create new information needed for molecules-to-man evolution; it can only select for information (traits) that already exist. Having accomplished the task of evolving into the reptilian form, birds and mammals come next. Both birds and mammals are supposed to have come from different reptilian ancestors. In the most popular bird evolution hypothesis, theropod dinosaurs (the group to which T. rex belongs) are represented today by all birds. Birds are professed to be living dinosaurs, a distinction formerly reserved for crocodiles. Exactly how this happened in the course of geologic time is disputed at many levels. The media has placed feathers on dinosaurs when none were found with the fossil remains, and every theropod discovered is described as having feathers. The next time you read a story about a dinosaur find and the description includes details of behavior, coloration, and feather patterns, ask yourself what the evidence is for these inferences that are misleadingly presented as facts. In a vast majority of “feathered dinosaur” fossils there is no evidence of feathers. Recent alleged feathered theropod fossils from China have been exposed as frauds or later reinterpreted as not having feathers. The retraction of the original sensational claims is never as obvious as the fantastic headlines that are stored in the memory banks of the public. More and more dinosaurs are being drawn with feathers despite the fact that no feather impressions are found with the fossils. There have been several recent claims of feather impressions or “prefeathers” in dinosaur fossils, but those claims have not been substantiated, and there is ongoing debate in the scientific community. 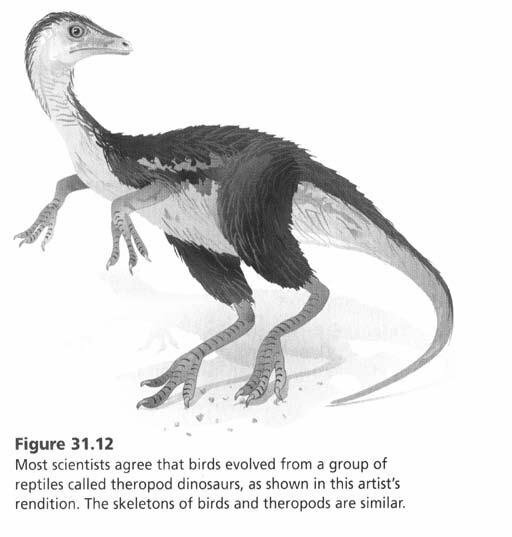 Many evolutionists go as far as to call birds "living dinosaurs." Despite the lack of fossil evidence and contradictory hypotheses about the evolution of birds from dinosaurs, the idea remains popular. Evolutionary models have a difficult time explaining the development of the many unique characteristics of birds from reptiles. The avian lung has a one-way flow that is interconnected to many small air sacs and a countercurrent blood flow system to maximize the efficiency of gas exchange. How this arose from the billows lung of reptiles is a mystery that evolution cannot accurately explain. Feathers are presented in a contradictory manner in the texts reviewed for this book. The Holt text relates that feathers most likely did not evolve from scales; the Glencoe text states that hair and feathers evolved from scales; and the Prentice Hall text implies the evolution of feathers from scales. This reflects the failure of evolutionary thought to accurately describe a key step in vertebrate evolution. If evolutionary thought provided the explanatory paradigm that its proponents claim, this issue would not be presented in opposite ways in textbooks. Many other issues within the topic of bird evolution—not to mention evolution in general—are disputed among different groups of scientists. While it is necessary for scientists to question each others’ statements and independently verify the results, the speculative nature of the evidence and the accompanying explanations leave the debate open to various interpretations. In historical science, like the evolution stories, testing the hypotheses is impossible because they do not represent falsifiable, testable, and repeatable processes. The subjective nature of interpreting supposed evolutionary relationships, whether from cladistics or “molecular clocks,” is of questionable validity. Starting with faulty assumptions will lead to faulty conclusions. Jaws clearly provide an advantage to certain fish in certain situations, but that does not mean that they must have evolved. The simplistic “just-so” jaw evolution story tells us that one piece turned into another without evidence of such a change occurring. The sudden appearance of fully formed jawed fishes and the presence of jawless and jawed fishes today do not support the evolutionary claims. In the past, mammals were considered latecomers in evolutionary time. They allegedly hid from the dominant dinosaurs during the day and were only represented by shrew-like creatures that scurried about at night. It was only when the dinosaurs were wiped out that they were able to fill the empty niches. This story has been modified as new discoveries have shown that mammal-like animals (these fossils cannot be evaluated for reproduction and milk production, so they are classified as mammaliaforms) had evolved to live on the land and then invade the water (Castorocauda lutrasimilis). This and other discoveries of relatively large mammals have forced evolutionists to rethink the emergence of mammals during the “age of reptiles.” Humans are classified as mammals in the evolutionary structure, and the development of hominids will be discussed in the next chapter. Though evolutionists claim to have a clear, big-picture view of the evolution of vertebrates, the devil is in the details. Just because things should have happened in a certain way does not mean that they did. The lack of an information-gaining mechanism is still the most effective argument against the growth of the evolutionary “tree of life.” The fossil record and living examples of vertebrates support the creationist “orchard” model, with the origin of all vertebrates on Days 5 and 6 of the Creation Week. The discovery of a 1.5-inch vertebrate fossil in Precambrian rocks has pushed back the date of the earliest vertebrates by millions of years. This specimen, found in Ediacaran rocks in Australia, looks like a tadpole with clear muscle segments and a vertebrate body plan. Many scientists are skeptical of its features due to the early rocks it is found in, but it is no surprise to creationists. The evolutionary story of the origin of multicellular life is further confounded by this discovery. The recent discovery of a fossil fish known as Tiktaalik has caused evolutionists to claim that a transitional form between fish and amphibians has been found. The fossil is claimed to be 375 million years old. With its bony forelimbs and its eyes and nostrils atop a flattened head, it is imagined that it lifted itself with its fins while wading through shallow streams. Several problems are apparent when thinking about calling this fossil a transitional form. The bones in the forelimbs are embedded in the muscle and not attached to the axial skeleton, which is the same bone structure in living fish today. The fossils lack the tail and pelvic fins. The presence of bony fins does not mean that the fish is developing into an amphibian. The coelacanth and lungfish that have been claimed as ancestors to modern amphibians in the past have not lived up to the claims, as this new specimen will not. Basing the interpretation on the flawed evolutionary framework will not lead to a true understanding of organisms that “appear” to be evolving. From an evolutionary viewpoint, amphibians represent a transitional phase as animals began to invade the land. Their characteristics are thought to be intermediate between fish and reptiles. Despite the evolutionary stories about this necessary transformation occurring, the evidence suggests that the hurdles are too great to overcome. The three major characteristics of reptiles that are supposed to have developed through time from an amphibian ancestor are scaly skin, the amniotic egg, and advanced lungs. The skin of amphibians is arguably more complex than the skin of reptiles. It contains many different glands that are not present in reptile skin, so the transformation to scales involves a loss of information in this regard. Scales develop from folds in the skin; so new information would need to evolve in order to direct the development of this new structure. Amphibians absorb and release gases through their skin as part of their respiration. This thin, permeable skin is alleged to have developed into a thick, waterproof structure—another developmental pathway that would have to appear. As the skin loses the ability to exchange gases, complexity must develop in the lungs of the “emerging” reptiles to accommodate life on the dry land. Development of an egg that won’t dry out on land was another accomplishment that supposedly happened as reptiles evolved. Amphibians must lay their eggs in wet environments to prevent them from drying out. Reptile eggs have a leathery covering that prevents loss of water but still allows gases to be exchanged with the environment. Since there is no record of the molecular and developmental changes that would have had to occur to make this transition, evolution can only provide a colorful story to connect the two through the imaginary expanses of geologic time. Fossil and genetic evidence supports the notion that amphibians have always been amphibians and reptiles have always been reptiles—both groups were created by the Creator to inhabit the earth. When the rich, diverse, and significant Riversleigh fossil deposits in Northwest Queensland were excavated, scientists found what they described as a new species of “ancient turtle,” believed to have gone extinct in the Pleistocene, as long as 50,000 years ago in the evolutionary timescale. About 56 miles downstream from Riversleigh, in Lawn Hill Creek, divers have recently discovered a new turtle species (Lavarackorum elseya), which is the same as the fossil Riversleigh one. By having the real thing, Australian scientists saw that they had “wrongly identified” (classified) the fossil turtle, and the living turtle showed no evolutionary change had taken place in all those alleged tens of thousands of years. Evolutionists believe that humans and dinosaurs never saw one another because the dinosaurs were extinct millions of years before humans evolved. Creationists claim that dinosaurs and humans were present together before and after the Genesis Flood. Dinosaurs would have been present on the Ark with Noah. After the Flood, dinosaurs apparently were brought to extinction by humans and other pressures. The dinosaur/dragon legends from all over the world support this claim. According to evolutionists, dinosaurs evolved 235 million years ago and dominated the landscape until 65 million years ago when they abruptly and mysteriously died out. 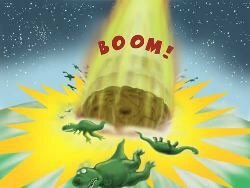 According to a biblical perspective, dinosaurs were created on Day 6 of the Creation Week and most became extinct as a result of the Flood described in Genesis. Not all dinosaurs died in the Flood—they would have been among the many kinds of animals on the Ark. Those that got off the Ark have since become extinct. 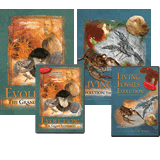 The history of the dinosaurs is not as complex as evolutionists make it out to be. The different views are a result of starting from a different set of assumptions. While we don’t know everything about dinosaurs, we can draw certain conclusions based on the evidence found in fossils. It is always important to note that what we know about the dinosaurs is limited by the evidence and the amount of interpretation that is reasonable. The presence of dinosaur/dragon legends suggests that man and dinosaurs lived together. The diet and behavior of dinosaurs can be known before the Fall—they were all vegetarians (see Genesis 1:29–30)—but after the Fall many of them must have become carnivores based on tooth marks on bones in the fossil record. 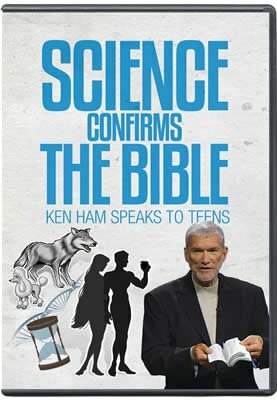 Although we can’t know everything about the dinosaurs, if we start with the Bible as the accurate history book of the universe, we can come to many reasonable conclusions about their history. A recent fossil find in China lays to rest the notion that mammals were small, nocturnal creatures during the “age of reptiles.” An 18-inch creature with a two-layer fur coat, beaver-like tail, webbed feet, and the mouth of a seal was found fossilized in Jurassic Period rock dated at 164 million years old. This find pushes back the arrival of large mammaliaforms by 100 million years. This means that mammal-like ancestors had to evolve fur and other mammalian features on land and then evolve to be able to survive in the sea 100 million years earlier than large mammals were supposed to have evolved. The presence of this mammal-like creature, with all of its unique design features, is not a problem in the creation model because it would have been present on earth immediately after creation. The Flood preserved a sample of organisms that lived with one another from the beginning. A snake fossil found in Argentina has added to the scientific debate over whether snakes evolved on land or sea. The fossil has leg structures where its hind legs should be. The location suggests that snakes evolved on land in the evolutionary story. Whether the “legs” were used for crawling or mating cannot be known from the fossil. Many such “vestigial” structures are supposed to show a transition from legged to legless states. A snake with legs fits within the creation model with no need for adjustments. It is possible that this form of snake had legs, which may have been lost due to natural selection (without demonstrating molecules- to-man evolution). The origin of birds has always been a major problem for Darwinism, and even today little agreement exists about their evolution. One of the most difficult issues related to bird evolution is the evolution of feathers. Feathers are complex, designed structures required for flight, and are today found only on birds. A literature review on the evolution of bird feathers showed that even though feathers are found as far back as the Cretaceous, including many well-preserved samples in amber, the fossil record fails to provide solid evidence for feather evolution. The implications of this major difficulty for Darwinism are discussed in this article. The presence of feathers for flight has allowed birds to spread to every corner of the globe. Their coloration, songs, and flight make them a marvel of God’s creation. Animal skin types range from a thin structure seen in worms to scaly reptiles, feathered birds, and furry mammals. Each of these skin types performs a different function, and the information is different for each type of structure in the skin. Scales, hair, horns, nails, claws, and feathers are all made of the protein keratin and are outgrowths of the skin. Though they are all made of keratin, they are different forms of keratin. The structure of a feather is much more complex than it appears. Each feather contains a main shaft, barbs, and barbules on the barbs, which contain many small hooklets and grooves that act like Velcro to hold the feather together. There are over a dozen types of feathers. The nervous system to control flight is amazingly complex. The complex system of brain, muscles, lungs, tendons, and feathers must have evolved all at once in an irreducibly complex system. Each part by itself would not be likely to provide a survival advantage. The sudden appearance of fully formed feathers in the fossil record supports the idea of special creation. Many evolutionists hypothesize that feathers actually evolved for insulation and were later exploited for flight by modification. Some disagree with this idea, and it is still contested. The origin of flight in evolutionary hypotheses ranges from tree-down gliders to ground-up flyers. As there is no evidence for either theory, the speculative debate continues. Feathers and bird bones are relatively abundant in the fossil record, with 79% of the 329 living families known as fossils. No transitional structures between scales, skin, and feathers are known from the fossil record, suggesting birds appeared suddenly—during Day 5 of Creation Week. The complex differences between reptilian scales and bird feathers mean that a set of intermediate steps would have been needed, none of which are seen in the fossils. A hair-like follicle must have developed, making the evolutionary connection between hair and feathers more plausible. The problem is that this would not fit the other evolutionary evidence; so a story must be imagined to explain the miraculous development. The development from the billows-style lungs of reptiles to the unique features of the birds’ respiratory system is another insurmountable problem for Darwinists. The evidence clearly points to the amazing design of the Divine Creator of the Bible. In a blaze of publicity, primate fossil bones found in China were enthusiastically hailed by evolutionists as “the primate equivalent of the missing link.” The “dawn monkey,” Eosimias, was described as being shy, nocturnal, having “large, saucer-like eyes” and spending its life flitting about the treetops of humid Asian rainforests, catching insects, and drinking plant nectar. And what is the fossil evidence on which this story is based? Nothing more than some tiny fossil foot/ankle bones no bigger than rice grains! It is amazing how far the facts get stretched to accommodate the story of how primates must have evolved. The Ice Age that followed Noah’s Flood caused the ocean levels to drop. Land bridges between all of the continents except Antarctica allowed animals (and humans) to spread across the globe and populate different areas. Certain kinds were more successful depending on the climate of a certain region. In evolutionary thinking, marsupials are restricted to mainly Australia because of their isolation due to the splitting of the continents and their inability to compete with placental mammals in other areas. In the Flood model, animals would have rapidly spread out from the Ark after the Flood. Their migration paths most likely followed preferred food and habitat sources. Some animals went in different directions and established populations. Our limited knowledge restricts our ability to understand the details of this process. The presence of land bridges during the Ice Age that likely followed the Flood would have allowed animals to migrate to any continent from the Ark’s resting place, somewhere near modern Turkey. Populations of marsupials were present in places other than Australia but were apparently not able to survive as they competed for food and as the climate changed. 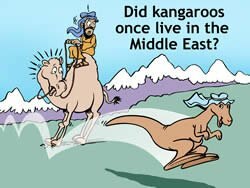 It was not necessary for a single kangaroo to hop all the way to Australia; its descendants could have accomplished the task over many generations. This is obviously not a problem in light of European rabbits that were released in Australia in recent times and have now populated every corner of that large continent. 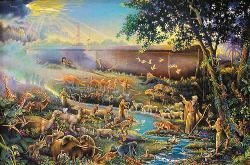 With the Bible as the foundation, distribution of animals after the Flood is not a problem to explain, although the details cannot be fully known. 9:12 The echidna enigma … and the platypus puzzle, Doolan, Creation 18, 2 (March–May 1996): 26–27. The echidna (spiny anteater) and platypus belong to the mammalian order Monotremata (monotremes) because of their unique ability to lay eggs. They have the other mammalian characteristics of fur and mammary glands, but they do not give live birth as the marsupial and placental mammals do. Both of the monotremes have a venomous spur on their hind feet. This feature, along with molecular “evidence,” has led evolutionists to believe that the monotremes diverged early in mammalian history to form a distinct group. They are often referred to as “primitive,” reflecting the evolutionary bias. The lack of any possible ancestors from the fossil record leaves their evolutionary history a complete mystery. Fossil monotremes show no distinct differences from living specimens, giving the appearance that they were created fully formed as described in Genesis and were fossilized as a result of the global Flood of Noah’s day. 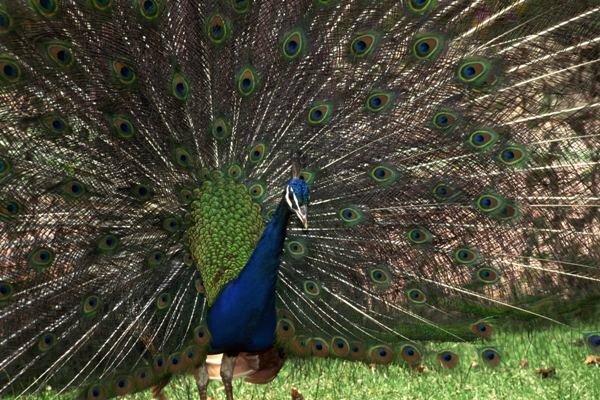 The amazing amount of developmental control that is required to produce the patterns in the peacock’s tail defies the informationproducing limits of mutations. These amazing patterns are evidence of a Creator—they are not an accident. One of the most dramatic and well-known examples of sexual selection occurs in the tail of the peacock. The display feathers come at an extreme cost to the individual male, but females apparently choose the males to mate with based on their plumage. How this mechanism originally developed is an enigma to evolutionists, and the fact that it contains several irreducibly complex systems increases the difficulty of finding an explanation in the evolutionary framework. The fact that the conspicuous nature of many courtship displays makes a male less able to hide and/or avoid predators transforms “survival of the fittest” into “survival of the handsomest.” The male that has the most extreme trait (long tails) will pass his genes onto his offspring, which will tend to have the longest tails in the future. How the females select the males is still a mystery to evolutionists and creationists alike. There is no evidence for a correlation between beauty and health or how the simultaneous development of a sexual trait and its preference would have emerged in the evolutionary story. The feather pattern of the peacock (female peafowl are called peahens) contains many incredible features that defy an evolutionary explanation: all feathers are oriented to a central point, the intricate pattern of “eyes” are uniformly distributed, modified barb structures are in certain parts of the feather, feathers contain only one pigment, feathers produce colors using multiple layers of thin films, and many others. The “eye” pattern is actually produced by the interaction of many thousands of barbules whose development must be strictly controlled, layering that varies by 1/20,000th of a millimeter. The mathematical accuracy within the pattern of an individual barb and the overall shape of the “eye” pattern defy mere chance and time as a designer. The amount of original information that must be encoded for this type of a pattern clearly points to the hand of the Intelligent Designer. Although neither creationists nor evolutionists can explain all of the details of development of intricate sexual displays, the belief that a Creator put beautiful traits in creatures makes much more sense than the just-so story that time and chance got together to produce them by accident. Some evolutionists believe that at least 30 major ice ages have occurred over earth’s history. Most creationists hold to the view that there was a single ice age in the recent past. Evolutionists attempt to show how mass extinctions occurred on a global scale following the last (or first and only) Ice Age. The explanations include extinction by climate change, extinction by overhunting, or extinction by diseases introduced by humans and their domestic animals. Each of these hypotheses has major problems, and scientists from around the world have been unable to agree on this issue, even after over 100 years of study. Details within a post-Flood Ice Age model seem to explain the evidence the best, but the Bible is the foundation for such thinking. Therefore, evolutionists must reject the clearest of the interpretations. The problems with the evolutionary models lie in the fact that their basic assumptions do not line up with the true history of the earth described in the Bible. Since feathers and reptilian scales develop in fundamentally different ways, why do evolutionists assume that they evolved from the same structure? Do all scientists agree on the pattern of evolutionary development (phylogenetic tree) of vertebrates? How can we know which view of history is true? How do scientists resolve conflicts between cladistic studies and “molecular clock” studies? What type of evidence would scientists accept to suggest that birds did not evolve from dinosaurs, amphibians from fish, reptiles from amphibians, etc.? If it could be demonstrated that amphibians did not evolve from fish, what would happen to the remaining parts of evolutionary theory? Does the fossil of a fish with bony structures in its fin indicate that it was evolving into an amphibian? 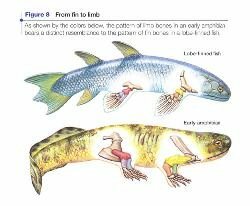 Are there other alternative explanations for why some fish have fleshy and bony fins, like the living coelacanth? Since feathers and fur both develop from a similar tube structure in the skin, why don’t scientists believe that they evolved from one another? How do we decide when it is convergent or divergent evolution? What evidence do scientists use when they describe the lifestyle and particular habits of extinct species? Does this allow for multiple interpretations that seem to fit the data? What are some of these alternatives within evolution? What lines of evidence do scientists use when they claim that dinosaurs had feathers even though no feathers have been found with the fossils? Is this good science? How should the lines in phylogenetic trees be interpreted? Are the branching points based on actual evidence, or are they an interpretation of what “must have happened” to get to where we are today? Why don’t all textbooks and authorities use the same dates for major events in evolutionary history? How do we decide which authority to trust? The New Answers Book by Ham, et al. 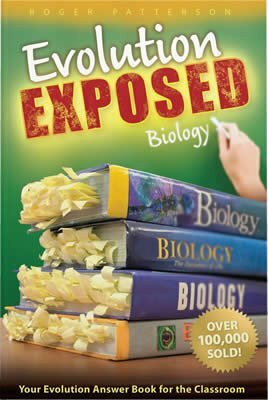 This book helps teens discern the chronic bias towards belief in evolution that permeates today’s three most popular high school biology textbooks.